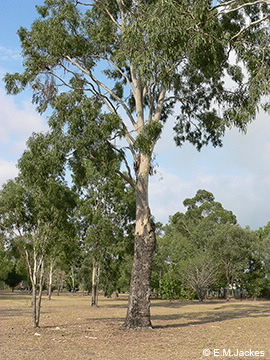 This tree is distinguished by the dark tessellated or crocodile scale bark forming a dark stocking at the base of the trunk, with smooth white bark above it. The narrow, lanceolate leaves may be up to about 15 cm long and 1 cm wide. The fruiting capsules are thin and can be squashed easily with the fingers. Hence, it is also known as one of the paper-fruited bloodwoods. Flowering chiefly occurs from December to January. JCU acknowledges the Yirrganydji and Djabugay Peoples for sharing their Indigenous Knowledge and pay respect to the elders past and present. “Known as Koy-ung-kil-pi. Medicine made from tree to treat dysentery, wounds, diarrhoea and flus. The timber used for making manual tools”.